A serene oasis on the northern outskirts of the greater Tampa/St. Petersburg metropolis, Lake Rogers Park is an easily accessed site that is perfect for families and traveling birders who happen to be in the area. A 2.5-mile trail circles its namesake lake, where you can watch Ospreys fishing, Wood Ducks and Pied-billed Grebes swimming by, and Snowy Egrets, groups of White Ibis, and Little Blue Herons wading in the shallows. Check the pine flatwoods and oak hammocks for migratory songbirds in October and April; Swainson’s Thrushes and Blackburnian Warblers are possible here. In winter, look for Hermit Thrushes and flocks of Yellow-rumped Warblers. Great Crested Flycatchers, White-eyed Vireos, Northern Parulas, Carolina Wrens and Pine Warblers are all common breeding species; Sandhill Cranes, Anhingas and Wood Storks are sometimes seen. 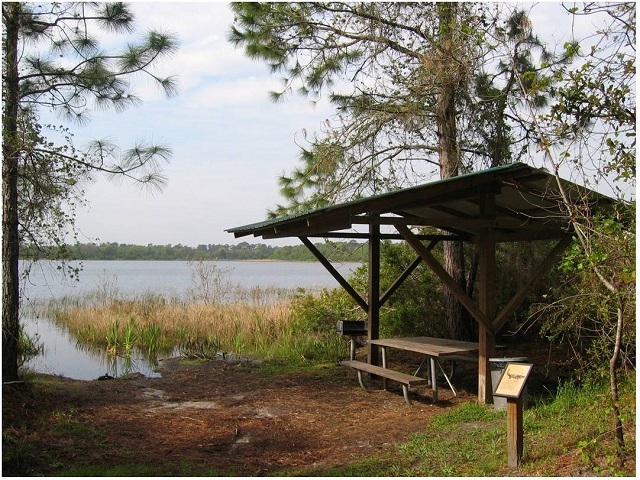 Additional amenities include picnic shelters, a canoe/kayak launch and rentals (gasoline motors are not permitted in the park’s two lakes).